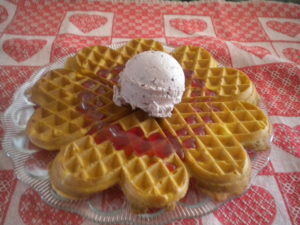 Today is ‘National Waffle Day’. 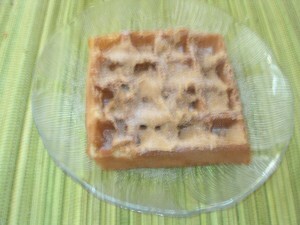 Here are some Waffle Treats for you to make for your friends and/or family. 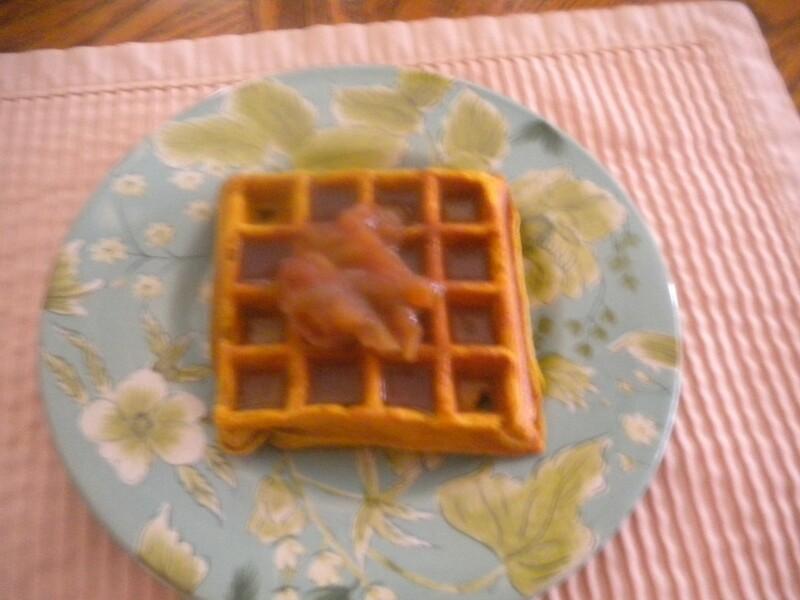 Sweet Potato Waffles – a great way to use leftover Sweet Potatoes or just to use your Sweet Potatoes. Good for Breakfast and or Dinner instead of Potatoes. 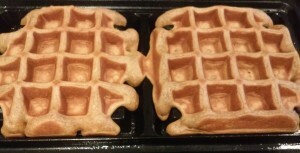 Gingerbread Waffles – this is definitely a ‘makeover’ using leftover Gingerbread pieces. 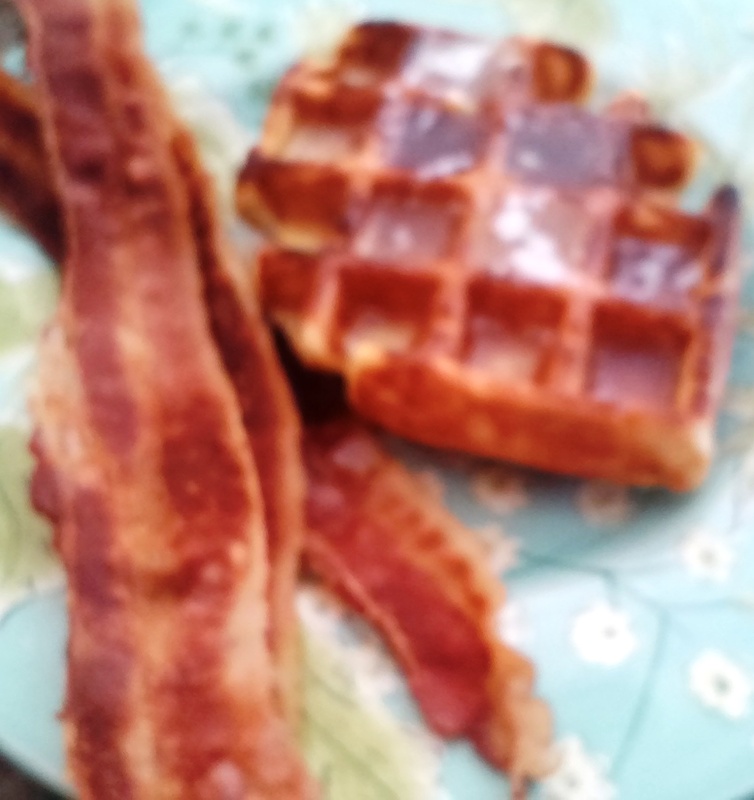 This may not be appropriate for ‘National Waffle Day’ in August but keep it mind for your Winter Breakfasts or Desserts! 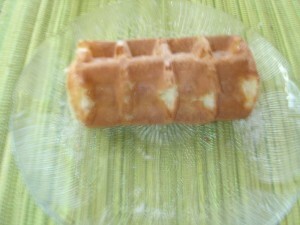 Hong Kong Waffles – a favorite of mine – fun to make and fun to eat. These Waffles are sold as ‘Street Food’ in Hong Kong but can easily be made with your Belgian Waffle Iron. 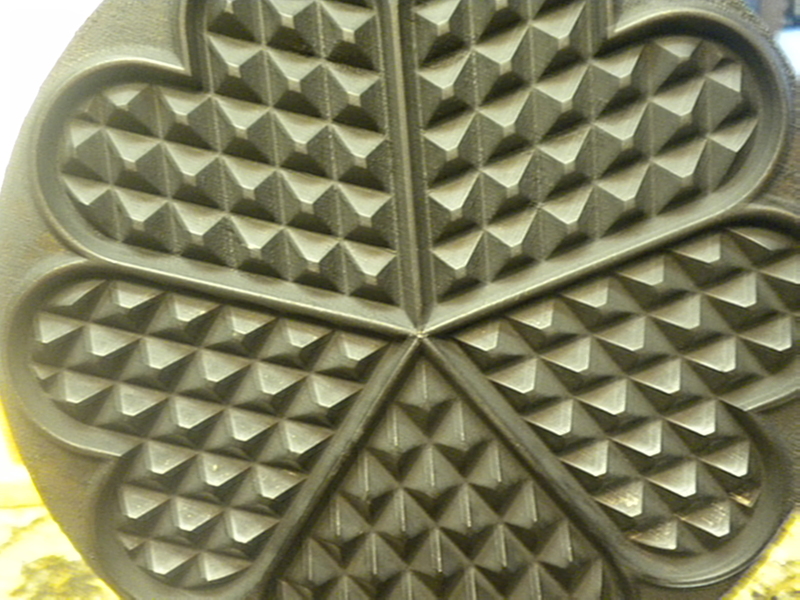 More Waffles – just an overview of the types of Waffle Irons and recipes available today! 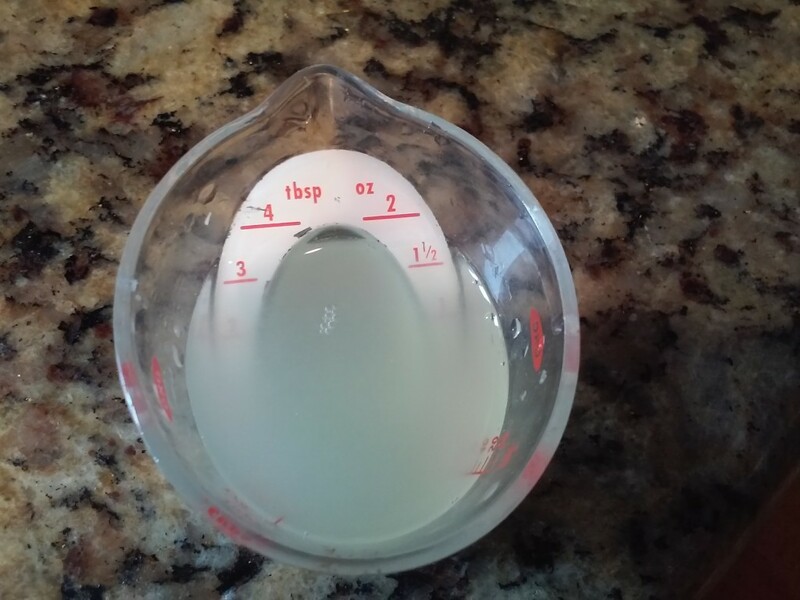 Lemon Juice – free (the lemons were given to me – if you have to purchase the lemons you will need 1-2 lemons depending on the size – also the price will vary from store to store and from State to State. Now, what did I do with this batch of Ricotta. I made Cannelloni for dinner tonight and was able to freeze half of them for another meal. 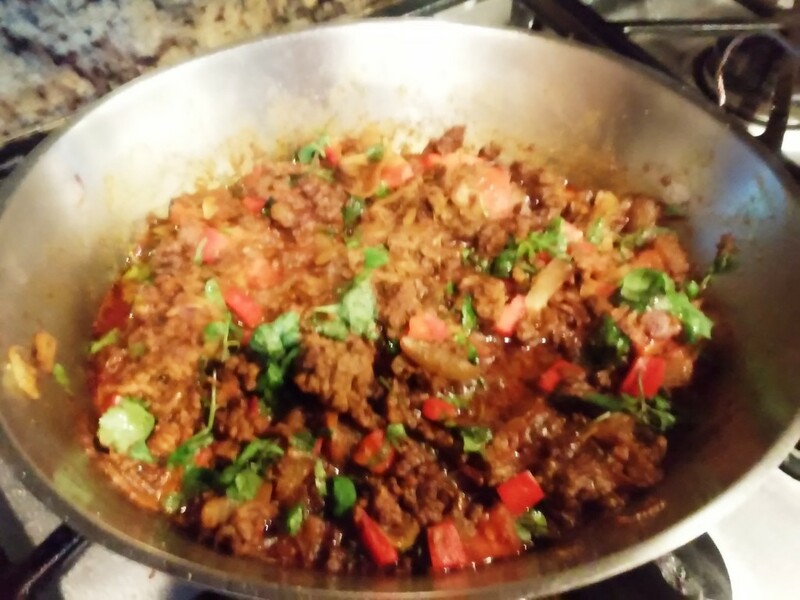 If you have four or more eating dinner, the whole recipe will be sufficient for 4- 6 people, depending on appetites. If teenage boys are involved, then you will have dinner only for four. If like us, there are only 2 people at the meal, then you will have at least 2 meals out of it and maybe more. While the Crepe Batter was resting, I started the Meat Sauce that was to go over the top of the filled shells. 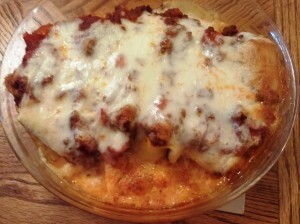 Next, I shredded the Mozzarella Cheese that was to go over the Meat Sauce. 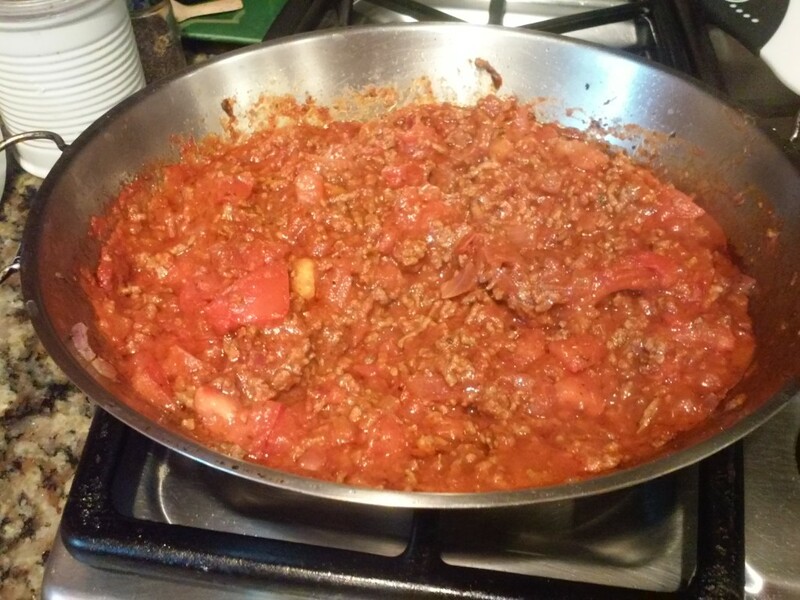 If you need a recipe for the Meat Sauce you can just use my Fresh Tomato Sauce but start out by sauteing a pound of ground beef, chicken or veal before you add the other ingredients. Or you can use only Tomato Sauce. 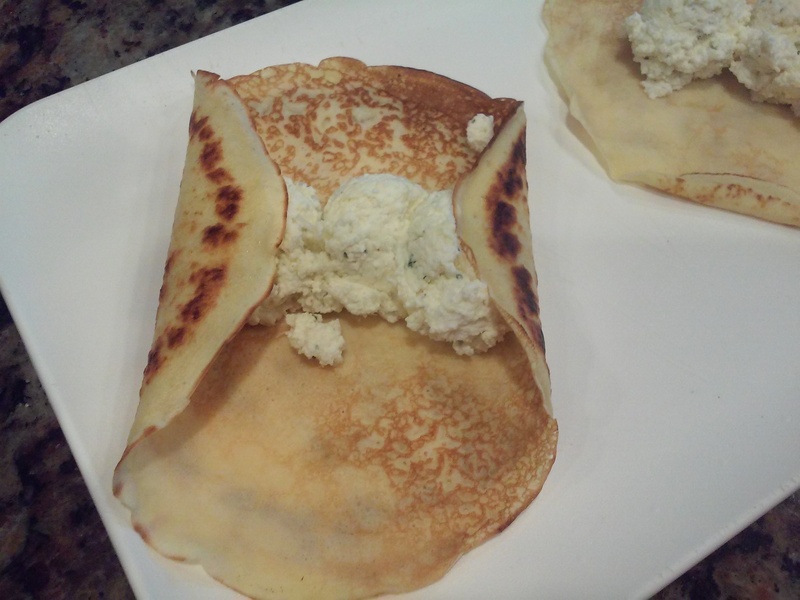 After the Crepes are made and the Sauce is simmering, prepare your Ricotta Cheese by adding an Egg, some freshly shredded Parmesan, Basil and about 1/2 tsp. Salt and 1/4 tsp. White Pepper or whatever your taste buds decree. The Basil that I added was actually a combo of minced Basil and Garlic in Olive Oil. 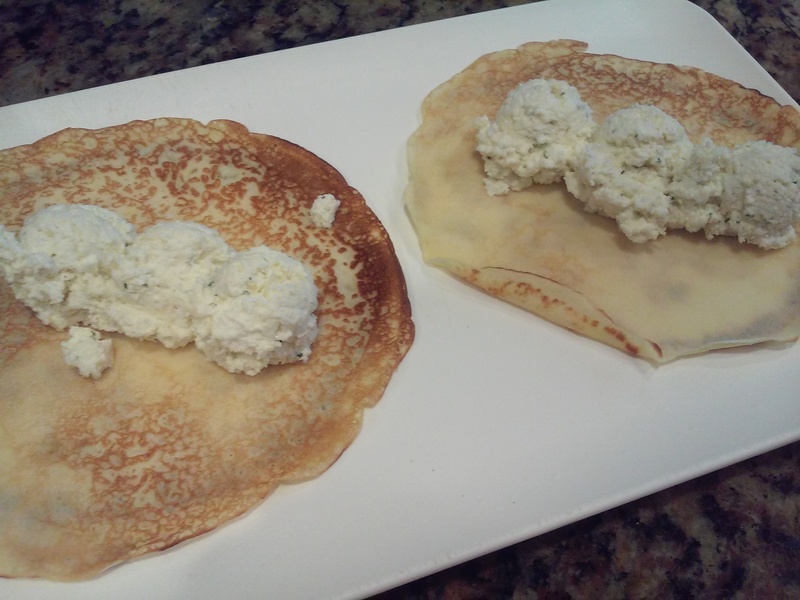 Set the Crepe Shells out on a flat surface and place 2-3 Tablespoons of the Ricotta filling on each Crepe (depending on the size of the Crepe). Fold in the sides and then the top and bottom. 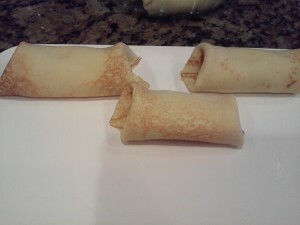 Place each filled and rolled Crepe in a baking dish that has been lightly oiled with Olive Oil. Place them close together. 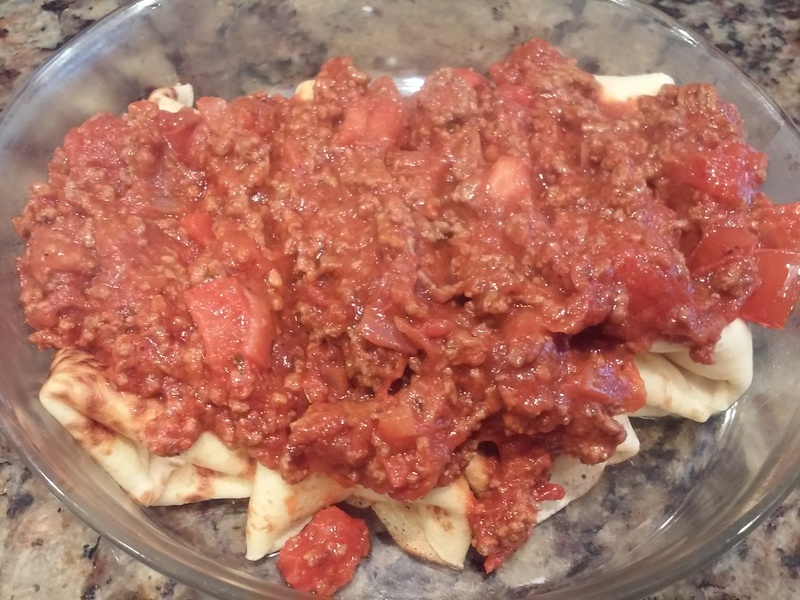 When all the shells are filled, wrapped and placed in the baking dish top with the Sauce and some shredded Mozzarella Cheese. Bake at 350 degrees for 20-30 minutes or until everything is hot and the Mozzarella Cheese has melted. Serve immediately with a mixed Green Salad and fresh Italian Bread, if so desired. This dish will serve from 4-6 people, depending on appetites. We had enough leftover for a second meal and half the Manicotti went in the freezer for a third meal. Of course, we are only two people and so we are lucky enough to have more than one meal out of this dish. Our ‘Culinary Makeover’ today is a relatively simple one. Mashed White Sweet Potatoes turned into Sweet Potato Waffles which I served with Chili con Carne. A very delicious meal, but with only 2 people in the household we had Waffles left over which we in turn toasted for Breakfast the next day. 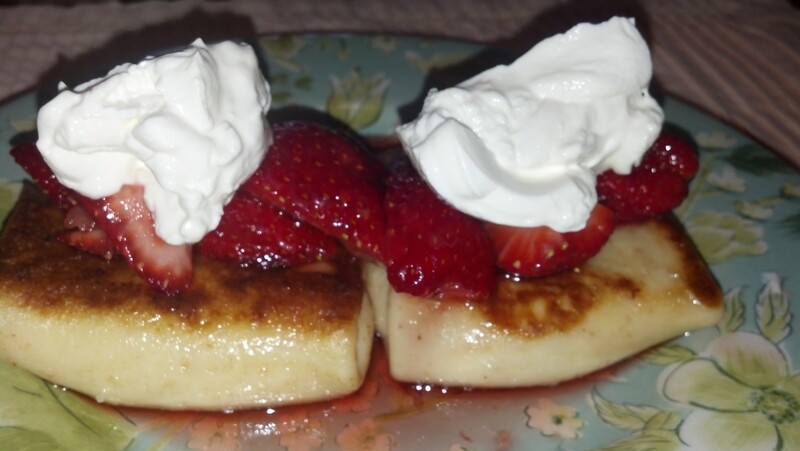 They tasted really delicious with melted Butter and Maple Syrup! The Sweet Potatoes I purchased had red skin and I had forgotten that the Red Skinned Sweet Potatoes are not red inside but White. 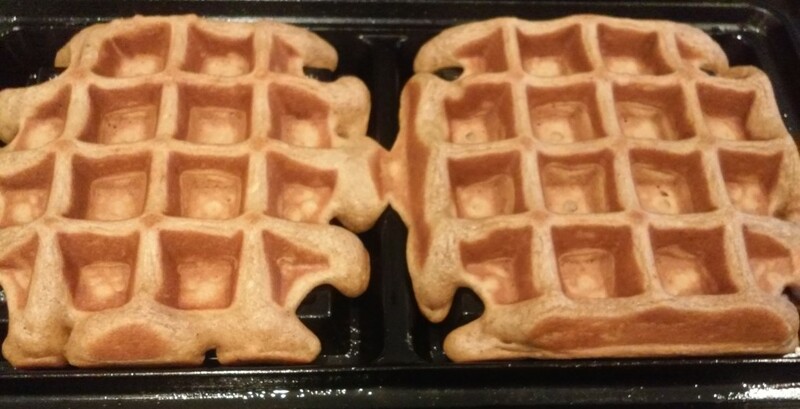 They were a little more starchy than the gold ones but they still tasted good and were perfect for making Waffles. I had forgotten to put in a leavening agent which would have been maybe 1 tsp. 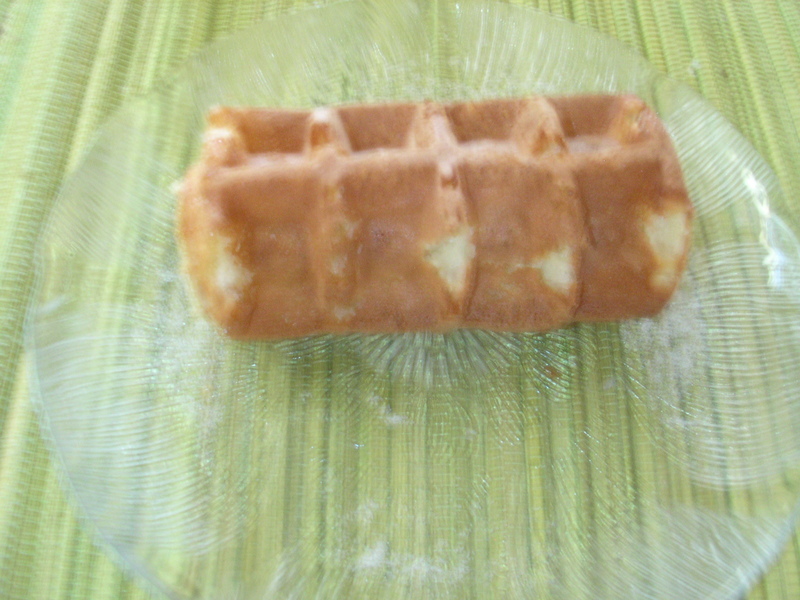 Baking Powder, but the waffles came out very well without it. 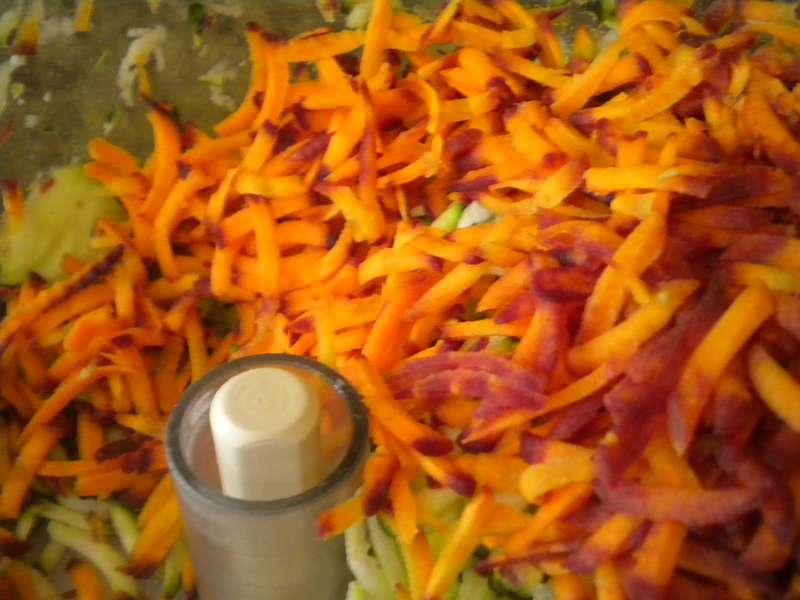 You can use any type of Sweet Potato or even Russets that had been mashed for dinner the night before. Try your hand at it and see what you can come up with! 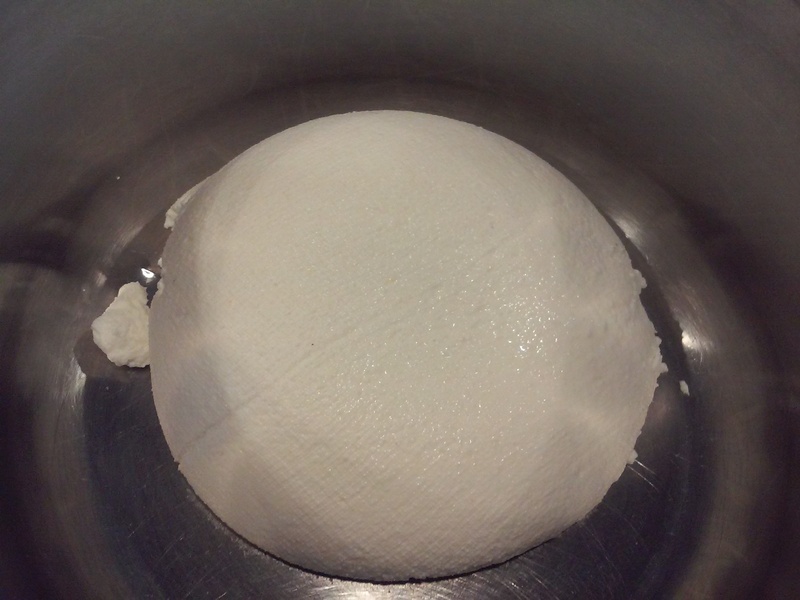 This time I decided to make a batch of Ricotta using Rennet Tablets. It was my understanding that a quarter of a Rennet Tablet would be sufficient to curdle two quarts of milk. Unfortunately, this did not happen. When I used the Lemon Juice the heated Milk curdled within about 2 minutes. With the Rennet, I cooked and stirred with the Rennet added (after the milk came to a boil) for about 10 minutes. Getting frustrated I added Lemon Juice and it still did not look curdled so I added the rest of the Rennet Tablet. 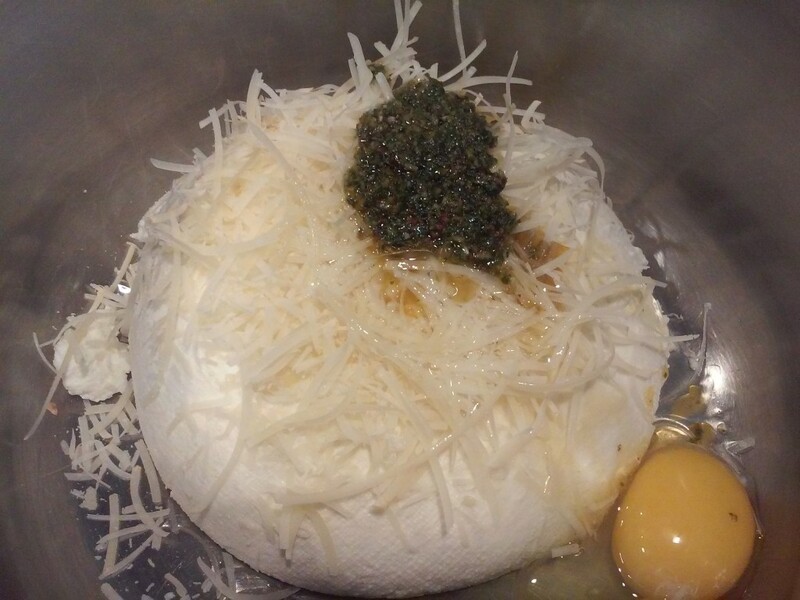 It finally curdled but did not yield as much Cheese as the Lemon Juice alone did and it was much looser and did not hold its shape. 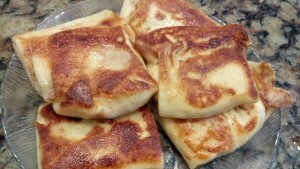 Fortunately I used the Cheese in Sweet Cheese Turnovers so the thickness did not matter as much. To add body to the Cheese I also used about half a carton of Mascarpone (thick Italian Cream Cheese). Next time I will go back to the Lemon Juice. To make the Turnovers I placed the drained Ricotta in a medium-sized mixing bowl and added half a carton of Mascarpone, (about 4 oz.) along with 1 Egg, 2 Tablespoons Granulated Sugar (this should be to your taste) and some Vanilla. 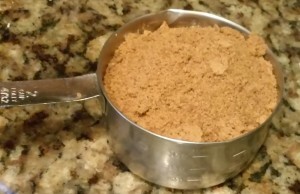 A pinch or two of ground Cinnamon may also be added if desired. 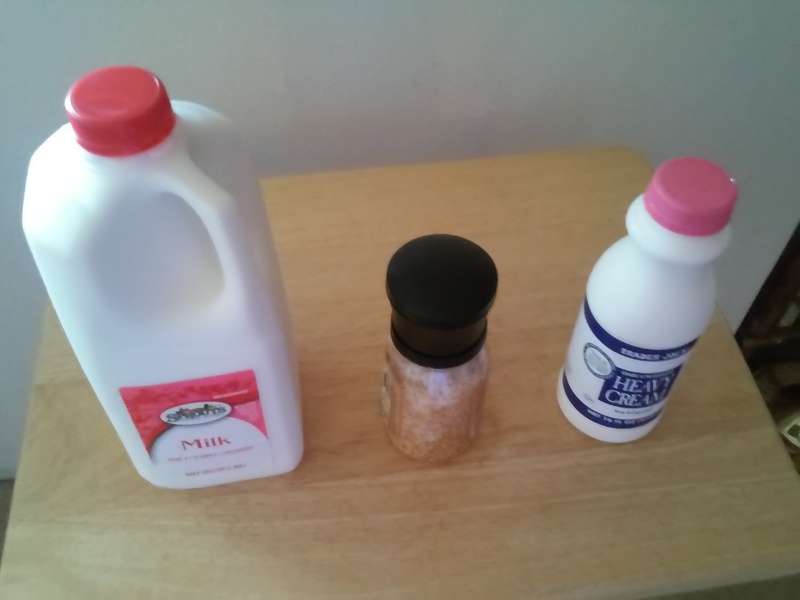 Combine the mixture and refrigerate until ready to use. 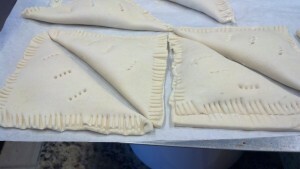 For the Turnovers I used commercial Puff Pastry but you can use Pie Crust or any other type of Dough that you prefer. Have a small bowl of cool water at hand to help seal the pastry edges along with a fork to crimp them. 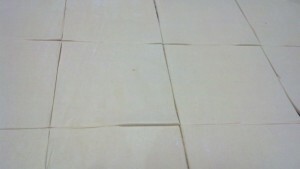 Lay out the Pastry on a cutting board and cut into 6″ squares. If needed you can use a clean ruler to measure. I usually just eye-ball it. Use a long knife or Pizza Wheel. Keep your eye on the end point and you will end up cutting a straight line. If you try to guide the knife or wheel, it is likely that your pieces will end up crooked. (I learned this little trick from my Mother who used to make all our clothes – when she cut out fabric she always said, keep your eye on the place where you want to end – this will guide your hand and keep it straight) It works every time! Arrange the squares so that they are facing you as a diamond. 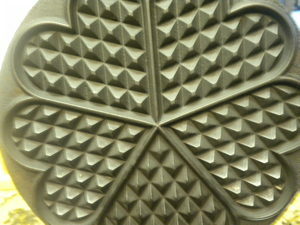 Place a scoop of the filling on each square. (I used a #30 food scoop – about 1 1/2 Tbsps.) The filling should be placed just below the mid-point which will give you enough room to fold over the pastry and seal the edges without the filling oozing out the sides. Using your clean finger or a pastry brush lightly coat the edges of two adjacent sides with the water; fold over into a triangle and then crimp with the fork. If you plan on baking the Turnovers right away preheat your oven to 400 degrees. Line a baking sheet with parchment. 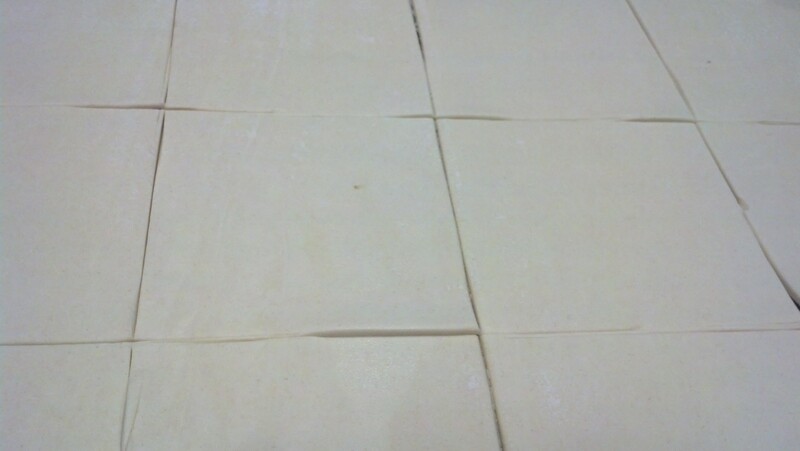 Place the Turnovers on the lined baking sheet with at least 2 inches between each turnovers on all sides. Even though there is no leavening agent as such in Puff Pastry, the layers formed by the Butter will puff up tremendously. Once the baking pan is full brush with beaten egg and sprinkle with Turbinado Sugar. Bake in your preheated oven for 20 minutes (DO NOT OPEN THE DOOR UNTIL THE 20 MINUTES ARE UP). The Turnovers should be a golden brown when completely baked – if after 20 minutes they are still too pale then bake for another 5 minutes or until golden brown. 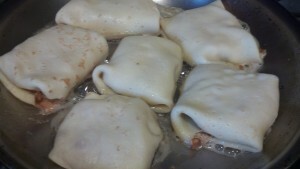 The Baked Turnovers are the Feature Photo above. If you plan on freezing all or part of the Turnovers before baking them you can place them as close together on the sheet that you can as long as they don’t touch each other. 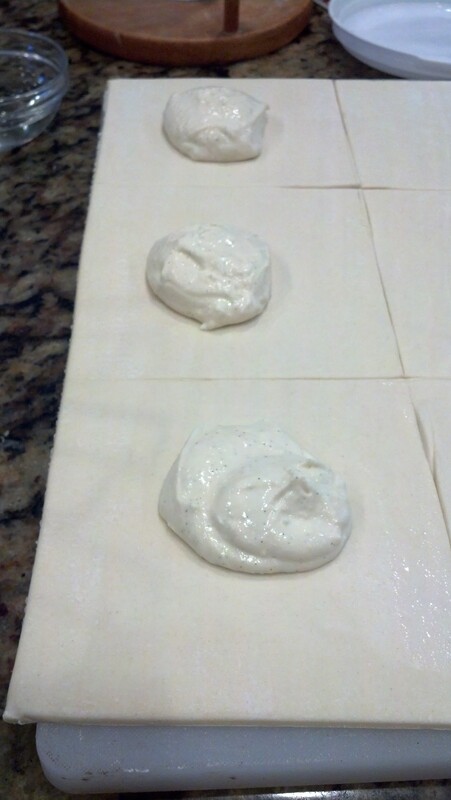 Once they are frozen wrap them in plastic wrap or the parchment and place in a freezer bag. You can remove and bake as many or as few at a time as you need. Here we are again talking about Breakfasts. Since September is ‘National Breakfast Month’ this is a good format to use – Breakfast is the most important meal of the day – simply because you are breaking a long fast between the last meal of the day before and the first meal of the current day. Your body, like your car, needs fuel to run on and your brain especially needs that fuel to keep you thinking straight. In the last blog I talked about Western Style Breakfasts – that is the Breakfast as we know it in American and also in parts of Europe. 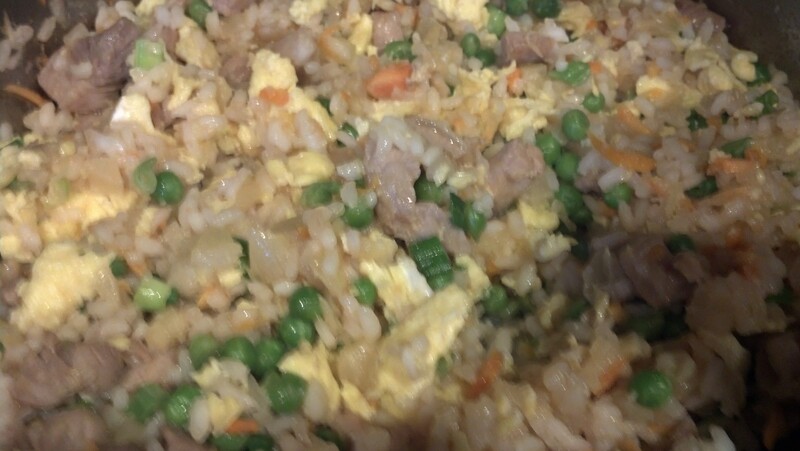 Pictured above is Pineapple and Pork Fried Rice – this would make a good and healthy breakfast for any culture so try having an Asian Style Breakfast sometime if you have leftovers. Today I am going to be talking about Asian Breakfasts. People in Asia, for the most part, do not have special foods that they eat for Breakfast. Usually it is food left over from the day before. However, in China, Congee, a porridge made from Rice is the preferred Breakfast. Usually leftovers of vegetables, fruit or meat are added to the Congee. Interestingly, the last time we were in Thailand our Hotel served a Breakfast Buffet every morning. Since a considerable number of Chinese people visit Thailand, along with Westerners, the Hotel served a Chinese Breakfast. Congee with a large number of different items that could be added to it. They also served a Western Breakfast. I always have a habit of observing what other people are eating and I noticed that the Chinese guests were eating the Western Style Breakfast. I who always eat a Western Style Breakfast at home was eating the Congee or the Chinese Breakfast. I guess people all over the world do like a little variety in their food. Japanese people usually eat whatever is left over from the night before as do the people of Thailand. Even though Breakfast Foods per se are not common among the Thai people there are plenty of restaurants in Thailand that do serve a Western Style Breakfast. That being said, if you are Thai you probably have Rice along with perhaps some Pork or whatever happens to be available. 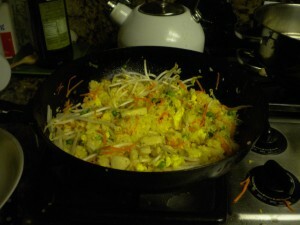 When my Sons and Daughter- in – Law were here visiting, my Thai Daughter – in – Law fell in love with Breakfast Jacks. She also loves to make a Thai Omelet which isn’t necessarily eaten for Breakfast. A Thai Omelet is similar to Egg Foo Young but is still different. It is quite delicious and can be eaten for any meal of the day. 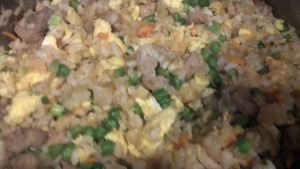 More Fried Rice Photos just to the left. 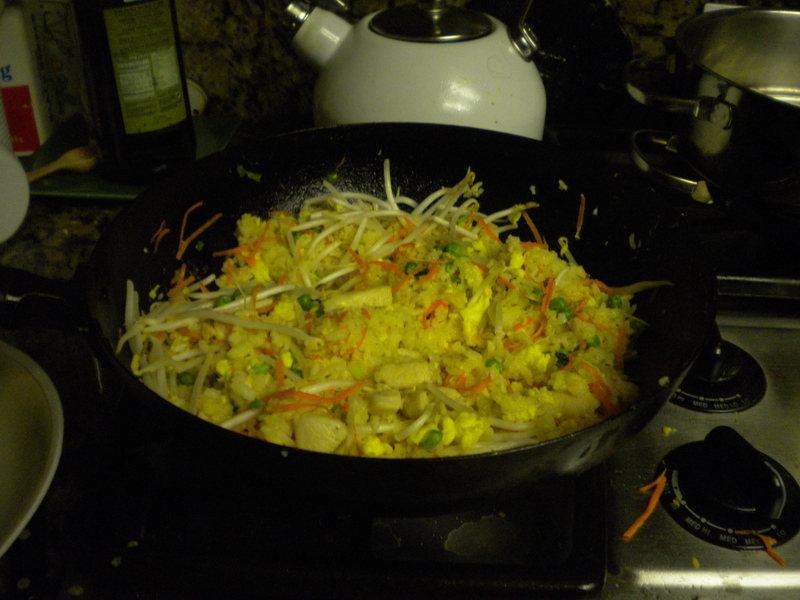 The top one is Chicken-Fried Rice – a good way to use up leftover Chicken and the one on the bottom is Fried Rice I made when we were in Kauai. 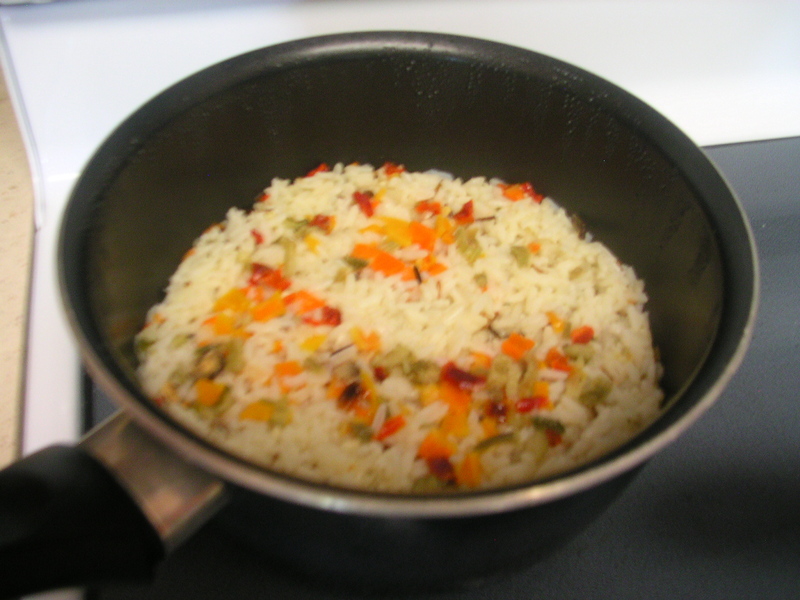 There is a strong Asian influence in modern Hawaiian Food and Rice is frequently eaten for any meal. For Western Breakfast Ideas please see the previous post ‘Breakfast’ in this Blog. 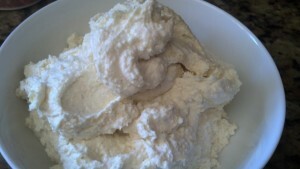 Now that I had a batch of fresh homemade Ricotta Cheese the next step was to make something with it. I decided to make a batch of Cheese Blintz to serve for Sunday Brunch with fresh Strawberries. The crepes for the Blintz are easiest to work with if the Batter is made at least 1 hour ahead of time and then allowed to rest in the refrigerator. If you try to make the Crepes right after making the Batter there will be too much air in the batter for the pancakes to form properly. 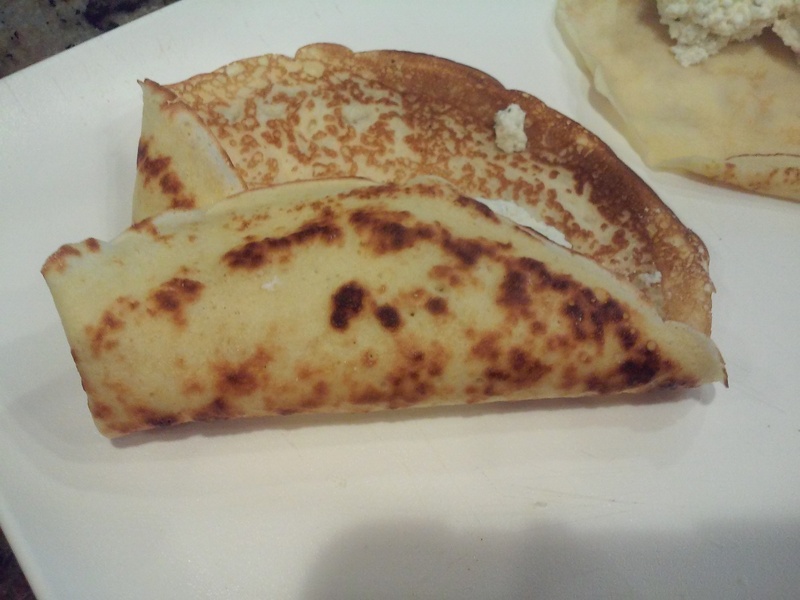 Now as far as I am concerned, the thinner the crepes the better, but of course you do need to have them thick enough to hold the filling without tearing. You can use the Sweet Crepe Batter Recipe under the Recipe/Dessert Section of this Blog. deserts/sweet-crepe-shells/ Just reduce the Sugar in the recipe from 1 Tbsp. to 1 tsp. I made the Crepe Batter with the residual Whey from the production of the Ricotta. This reduces the waste that normally would result from making the Cheese. To make the Crepes, the Filling and the topping just follow the procedure below. 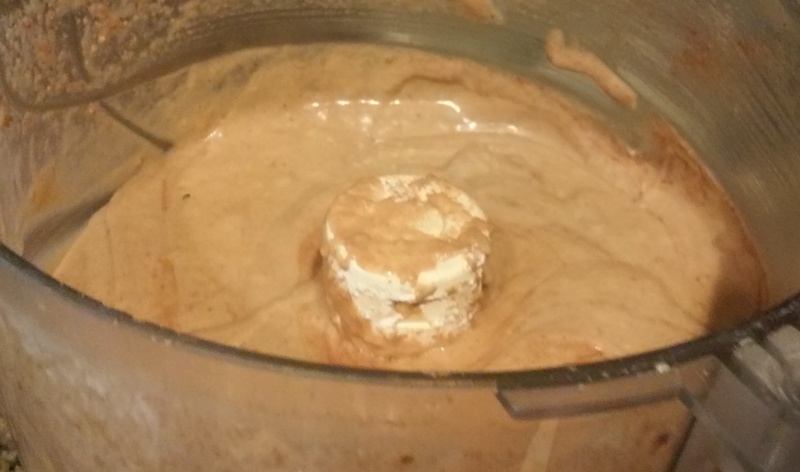 #1 – Make the Batter and refrigerate for at least one hour. 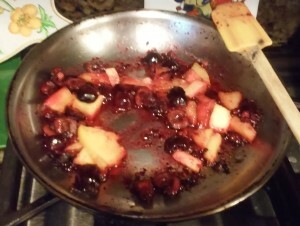 #2 – Rinse, dry, slice and sugar the Berries. If using Blackberries, Boysenberries or Raspberries eliminate the slicing procedure. Place the Berries in a bowl and squeeze the juice of 1/2 of a lime (for every pint of berries) over the Berries and then toss with 1/4 cup of Superfine Sugar. Taste and add more Lime Juice and/or Sugar as desired. 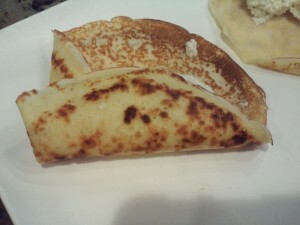 Heat the crepe pan until a drop of water splashed on it sizzles; melt the Butter and stir into the Batter. While you are pouring in the Batter, tilt the pan with your other hand to cover the bottom of the pan. 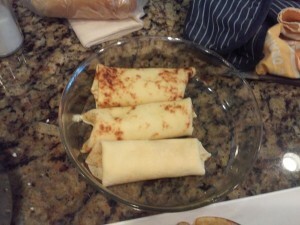 You will be browning the Blintz in Butter before serving them so you do not want the second side to be cooked too long. Fold in the sides and then fold over the top and bottom. You should have a square package. Melt enough Butter to make a thin sizzling layer in the bottom of a medium to large frying pan. When the Butter starts to sizzle add the Blintz, leaving about 1/4 – 1/2″ between each one. 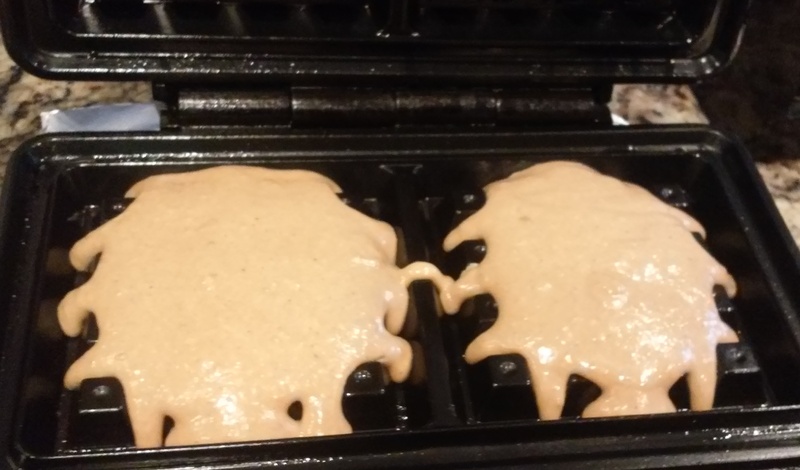 When the bottoms brown gently turn and cook the other side. 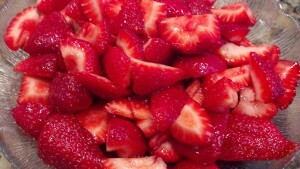 Serve while hot with the sliced Strawberries and Sour Cream or Whipped Cream as a Garnish. Tuesday we lunch at a Storefront Restaurant called Coconuts Fish Cafe. Even though it was storefront restaurant, the food quality was excellent and the décor was very attractive. In the photo above, the car is reflected in the door’s windows. (Not great photography, but the only photo I have) The tables and benches were all made in the shape of Surfboards as were the recipe boards. 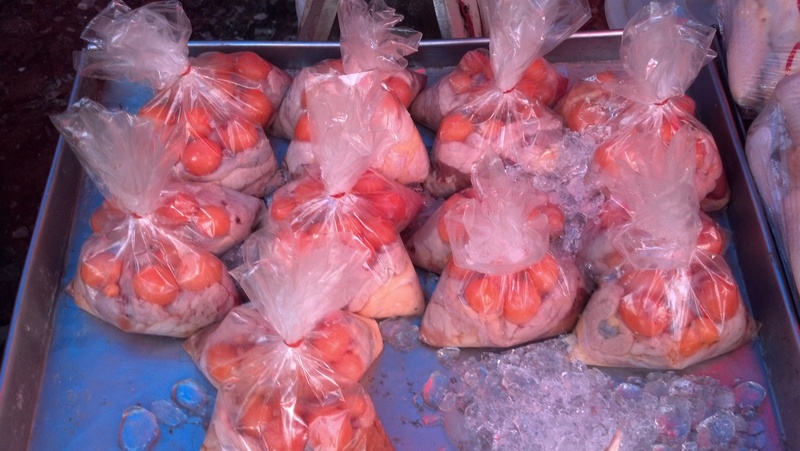 The fish was all very fresh and prepared quite well. 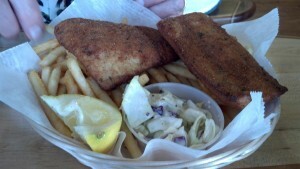 Ev wanted Fish and Chips; these were not your ordinary Fish & Chips that one would get Stateside. The meal consisted of Ahi and Mahi and the Fries were skinny and crispy. I ordered their signature dish which was Fish Tacos. 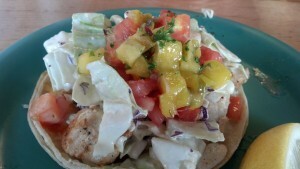 Again these were no ordinary Fish Tacos – the Fish was not breaded, just grilled and good and was again Hawaiian Fish. Diced Mango, Lettuce and Tomato were also on the Tacos. The order consisted of two Tacos and each was served on a separate plate. This meal was so good that we visited this Restaurant again before we left for home. Tuesday night, since lunch was sufficient to call dinner we decided just to stay in and cook a simple meal for ourselves. Dinner or Supper consisted of Bacon and Eggs, Grilled Pineapple and strips of Baby Jicama. If you have never had Baby Jicama do try it during the summer when the Farmer’s Markets Vendors are bound to have. It is tender and sweet and the skin is much thinner than in the more mature varieties. The next day was Wednesday and we spent most of the morning at Hosmer Grove in Haleakala National Park. The object of course, was to look for Native Birds and we did see the birds we set out to see – the I`iwi, `Apapane, `Amakihi and Maui Creeper as well as the Red–billed Leiothrix. On our way back from the Mountain we stopped and picked up lunch of Roast Beef Sandwiches and Potato/Mac Salad. The Potato/Mac Salad is an Hawaiian traditional side dish. Potato/Mac Salad is as it sounds: Potato Salad with cooked Elbow Macaroni in it – in this way you get two salads at once – Potato and Macaroni. After exerting a lot of energy on the Mountain we went back to the Condo and spent the afternoon resting. I tried out the Hot Tub at the poolside and treated myself to a Shave Ice – another favorite specialty in the Hawaiian Islands. 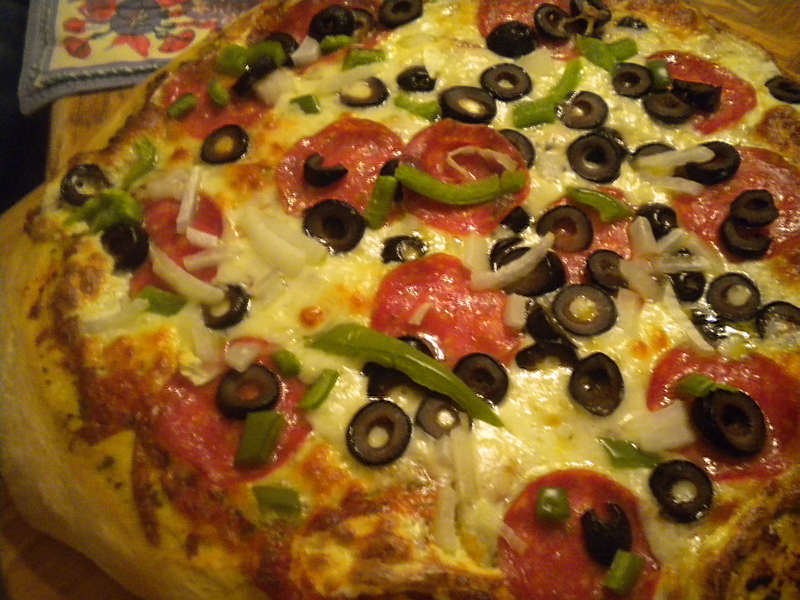 For dinner we went to a Restaurant called Pizza Madness and had a Pepperoni/Vegie Pizza. Even though it was only a medium it was so large that we had enough to take home for lunch the next day. The second Friday in October is ‘World Egg Day’. This is certainly fitting, because Eggs are probably the one major food that is consumed by people all over this planet. 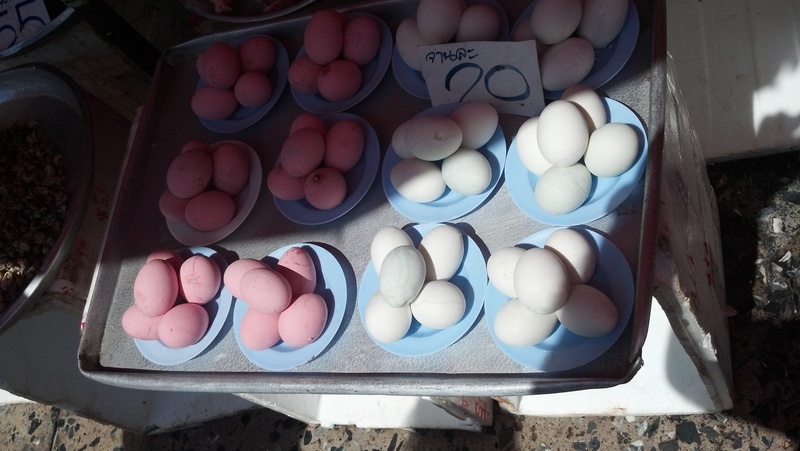 The majority of Eggs consumed are Chicken Eggs, but Duck Eggs are very popular in China and the South Eastern Asian Countries. The photo below was taken at an outdoor market in Thailand. Also popular in Asia are un-hatched Eggs. As kids we used to love them in Chicken Soup but health laws forbid the sale of them here in the States, at least in California. Quail Eggs are used in Gourmet Cooking, more for looks and ‘Eye Appeal’ than for nutrition as they are so small. 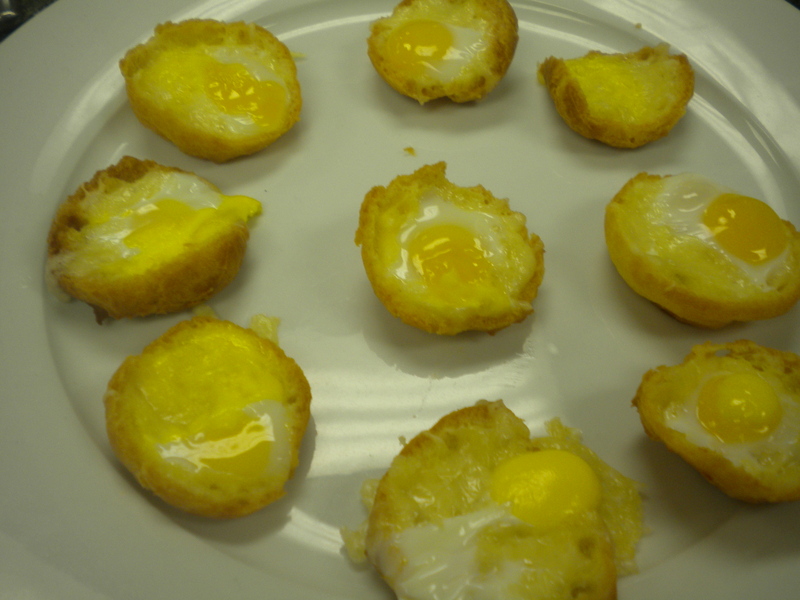 In the picture below Quail Eggs were baked in Mini- Pate Choux Cups (Cream Puff Shells) by the Teen and Pre/Teen students in our Summer ‘Basics Culinary Camp’ at Let’s Get Cookin’ in Westlake Village, CA. Turkey Eggs are probably consumed too as well as Ostrich Eggs which definitely top off the list of ‘large’ Eggs. One Ostrich Egg would probably feed a dozen people, if not more. Since this is World Egg Day, there will follow a short list of Egg Dishes consumed Globally by people all over the world. By far, the most popular use for Eggs is for Breakfast, but Eggs are one of those foods that can be consumed for Breakfast, Lunch or Dinner. The Egg is probably my all-around most favorite food. I can eat it any time of the day. Brazilian Omelet -this Omelet is made with Cream Cheese, Bacon, Pineapple and Avocado. Different, but tasty. The Brazilian Omelet is good for Brunch, Lunch or Dinner. Denver Omelet (USA) – made with Bell Pepper, Ham and Cheese. A popular Southwestern Dish. 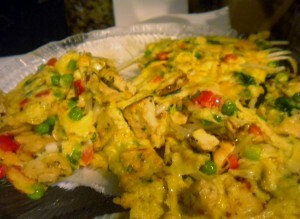 Egg Foo Young (Chinese) – a popular dish in Chinese Restaurants – made with Vegetables, Bean Sprouts, and occasionally Shrimp. Sometimes served with a Brown Sauce. Eggs Benedict – Eggs Benedict is an American breakfast dish that consists of two halves of an English muffin, topped with ham or bacon, poached eggs, and Hollandaise sauce. 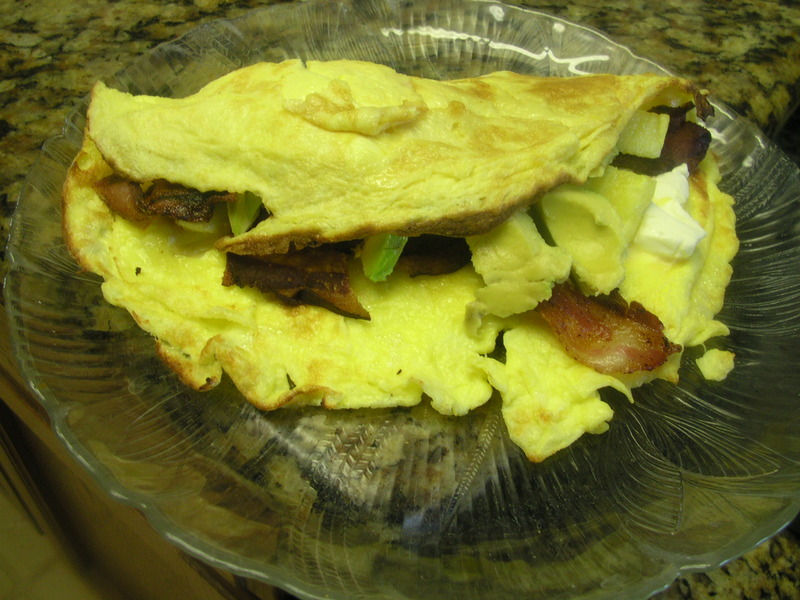 French Omelet – usually folded in half and somewhat moist inside. 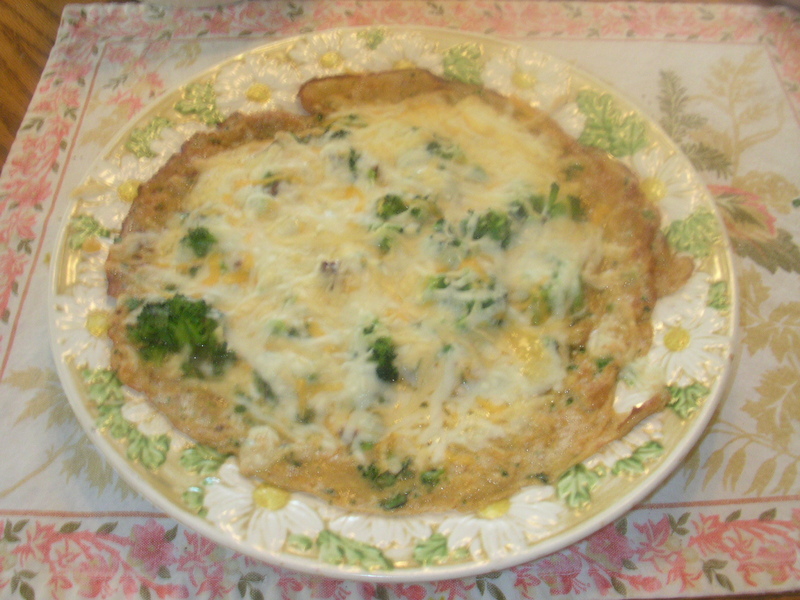 Frittata (Italian) – started in the pan and finished in the oven – the amount of ingredients in the Frittata make it difficult to turn so the top side is baked or broiled. Thai Omelet – similar to Egg Foo Young – contains Vegetables and sometimes meat – fried in oil in a Wok or pan. 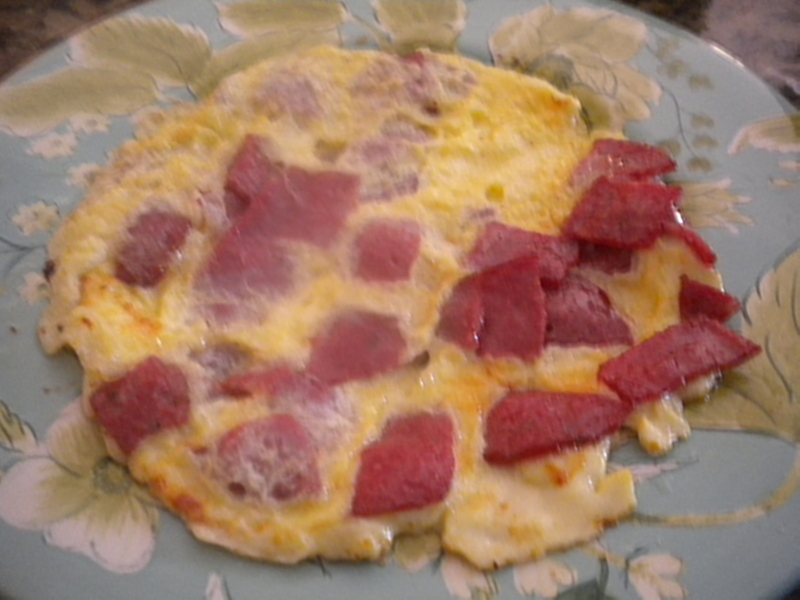 Results in a thin, crispy, tasty omelet. 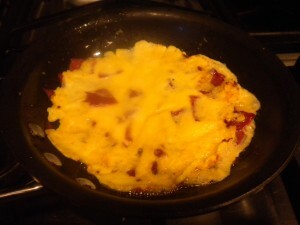 Tortilla (Spanish Omelet)– in Spain, the Omelet is called a Tortilla – usually cooked with sliced Potatoes in it – the American version with Tomatoes and Peppers is not really a Spanish Omelet. The Spanish Explorers probably named the Flat Bread ‘Tortilla’ because it looked like a Spanish Omelet. Whichever way you enjoy your Eggs or whatever kind of Eggs you like, do indulge. Eggs are a healthy food, which contain the best complete protein. Even though the yolks may contain cholesterol, they also contain lecithin which helps to reduce cholesterol. 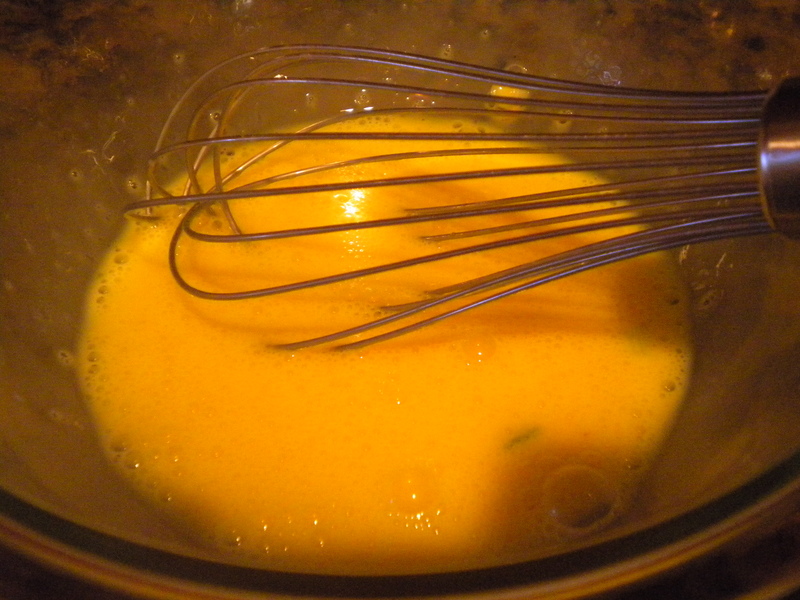 Lastly, don’t forget that Eggs are essential in most baked goods. For more info about Eggs see ‘The Versatility of Eggs’ under Archives June 2013. 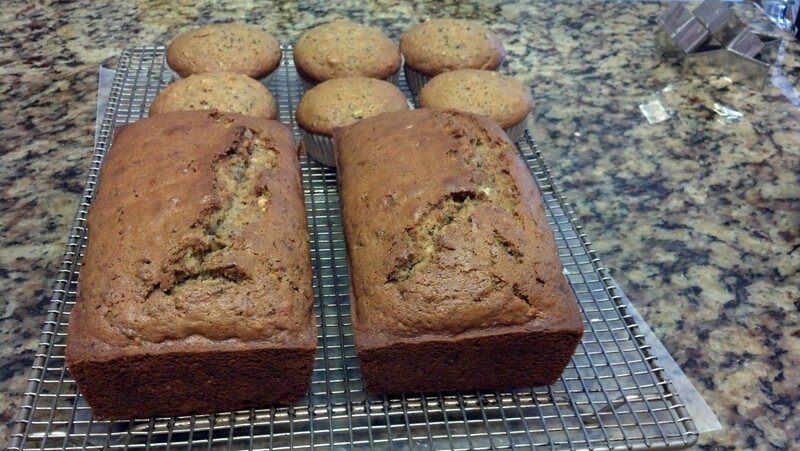 Today I wanted to get rid of some of the items in my refrigerator and freezer, so i decided to make a non-traditional Zucchini Bread, using Zucchini, Carrots, Chocolate Cookie Crumbs and chopped Macadamia Nuts and dried Pineapple. *I never use the total amount of Sugar and Oil that the original recipe calls for. Tastes just as good with less sugar and lasts just as long with less oil. 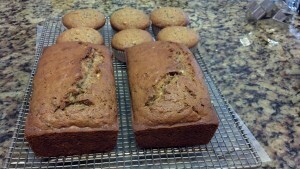 For a bread with more chocolate flavor you can substitute 1/2 cup flour with 1/2 cup baking Cocoa. Be sure and grease/spray your baking pans before getting started. If you are making muffins, you can use paper liners instead of greasing the pan. It is best to measure the flour and mix it together with the other dry ingredients before you get started. The oven should be preheating while you are making the batter. Beat the Eggs with a paddle beater in your electric mixer or whisk by hand. Add the Sugars and Vanilla; beat in. While still beating, slowly add the oil and then stir in the shredded fruit/vegetables. Stir in the Flour mixture; mix until well combined. Finally stir in the chopped Nut/dried Pineapple mixture. Pour into the prepared pans (half full) and bake as directed above. The fruit used can be varied – almost any fruit will do in this recipe. When a toothpick inserted in the middle of the breads comes out clean, they are done. However, I usually bake them about 5 minutes longer so that the tops are more brown and crispy. If you are muffin top lover, then definitely bake them just a little bit longer than necessary. The recipe also contains Eggs, Macadamia Nuts and dried Pineapple. The Butter and/ or Oil are also essential products for a healthy body. Whether you think it or not, oils are essential for survival! Try my version or create your own. This is a very flexible recipe and you can do a lot with it. By the way, I usually use Raisins (good source of Iron) but since I had the Pineapple and am trying to clean out my fridge and freezer, I used that. You can use whatever you have on hand! Enjoy!